Welcome To Artistic Stamped Concrete of Maryland Inc. Artistic Stamped Concrete of Maryland Inc. provides top tier stamped concrete contracting services for Central Maryland. 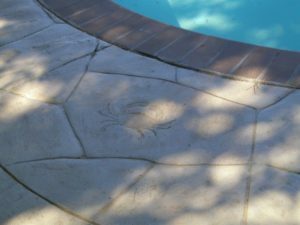 Stamped Concrete refers to creating a concrete mold or stamp, and driving the design into the concrete before it sets to dry. What’s left behind is the “impression” that concrete blocks, or in some cases designs were imprinted into the concrete itself before the blocks were arranged. In the above example, The “Stamp” Process is very linear, where we stamped a basic square design into the flagstone immediately after pouring to give the illiusion that each block of this walkway was laid together much like bricklaying. In this design, the homeowner wanted to give the illusion of a wood walkway. So using the same linear design we used for the first project, we stamped and outline of what would look like wood 2×4’s and then colored the dried concrete to give the illusion of stained wood. The end result is a “Wooden Walkway” That never chips or frays like traditional wood does when exposed to the elements over a long period of time. Artistic Stamped Concrete of Maryland provides uncontested stamp creation for all of our unique designs. When it comes to custom concrete stamping we can be as elaborate as you can imagine. Some of the more detailed stamps we’ll need to construct with your ideas in mind so when you call us for a consultation we’ll go over the process of designing your stamp so you get the measure of detail you’re looking for.